National and subnational boundaries of DHS regions can be visualized over time. More than 1,500 DHS indicators and U.S. Census population estimates in GIS format. Users without GIS software can make interactive maps of DHS indicators at STATcompiler. Blue Raster leveraged the power of ArcGIS Server and ArcGIS Online along with custom Python scripts to deliver all MEASURE DHS data in spatial formats (shapefiles and file geodatabase). Users can select indicators of interest (from more than 90 countries) and SDR will create custom data packages for download data . 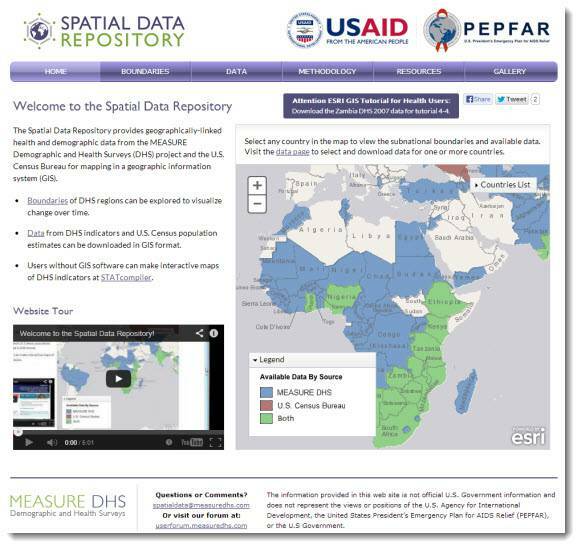 Visit Spatial Data Repository for access to USAID’s first public and accessible global health dataset. The Spatial Data Repository has been innovative from the start, being the first time that global health was shared in a GIS format. This new version of the website continues that innovation with new tools and abilities which Blue Raster, a key partner on this activity, was a driving force in implementing. I am particularly pleased with the ability to select and download your own data packages and also visualizing the DHS regions over time. MEASURE DHS has such a wealth of data and resources – we are excited by the opportunities that the new website brings in opening the data to the geographic community. The Spatial Data Repository is supported by the U.S. President’s Emergency Plan for AIDS Relief (PEPFAR) effort to provide data for decision making and improve knowledge and understanding of the impact of HIV worldwide. Blue Raster partnered with ICF International to deliver this new open data platform for USAID.